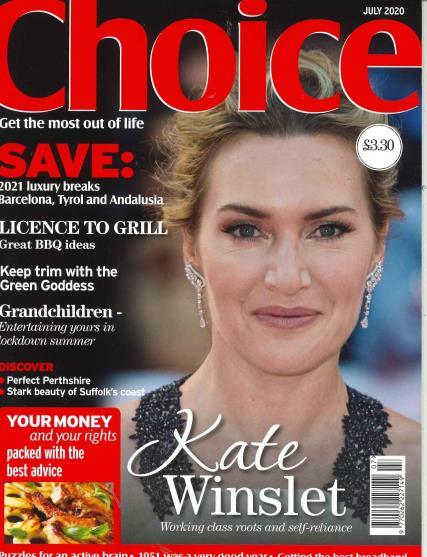 Choice is a monthly magazine entertaining and inspiring people to make the most of life. It is aimed at men and women over 50 and features articles on travel, food, wine, home and garden, wildlife, pets. Buy a single copy or subscription to Choice magazine. Followed by £26.20 every 12 months by direct debit. Choice magazine is by far the best publication that truly showcases all of the struggles, successes, and everything else that older people endure. Whether you are curious about what life is going to hold for you when you get older or if you just want a publication that understands who you are and what you’re going through, Choice magazine is the one lifestyle magazine that covers almost every aspect of getting old, including health tips, financial advice, relationship queries, and everything else to help keep you happy, healthy, and passionate towards all of your endeavours. Every issue of choice magazine is packed full of informative, interesting, and engaging articles supplement with stunning photography and illustrations all in an easy to read, glossy format. Many consider one of the best parts of the magazine is their detailed, 16 page section that covers financial issues and solutions for anyone over 50, including retirement savings advice, financial planning for vacations, and everything else you might be wondering about in regards to your money and financial plans. Choice is a great magazine - and I enjoy the varied topics very much. I liked the Health, cooking guide and IT help pages they were very helpful and what ever happened to Ali Malik. He was a great help. I enjoy the health tips and I try the exercises every week. It`s the right Choice.